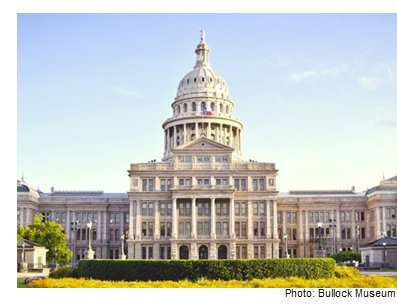 ​​​ AUSTIN – Construction is set to get underway in late September 2017 to build new state office buildings, parking garages and a green space along Congress Ave. north of the Capitol between 15th St. and Martin Luther King Jr. Blvd. The firs​t phase includes two new state buildings and three blocks of the so-called “Texas Mall” promenade, as well as utilities and above-and below-ground parking. Groundbreaking for the first phase will take place at 1801 Congress Ave., a parking lot across Congress Avenue from the Bullock Texas State History Museum. A 603,000-sf, 14-story office building is set to replace the parking lot. The $170.35 million building will serve as a new headquarters for the Texas Lottery Commission, as well as house other state offices that haven’t been determined yet. The second building included in the first phase—priced at $89.4 million—will be located at 1601 Congress Ave. and will be 12 stories tall and encompass about 416,000 sf. A contiguous, five-level parking garage will be built beneath the two new buildings. ​​Can't get enough office stories? Click here.